In such cases, during or post-processing, some method for spectral balancing or frequency enhancement could be used, that could lead to higher vertical and lateral resolution. An amplitude-friendly spectral balancing method would be preferred if some reservoir attributes are to generated on the data. In one such method, seismic data are first decomposed into time-frequency spectral components. The power of the spectral magnitude, P(t, f ) = m(t, f)2, is averaged over all the traces (j = 1,…K) in the data volume spatially and in the given time window, which yields a smoothed average power spectrum, given by Pavg(t, f ). where ɛ is the prewhitening parameter. A conservative value would be ɛ = 0.04. For larger surveys in which the estimate of the average spectra is statistically more robust, one might use values of ɛ = 0.01 in many cases, further broadening the spectrum. However, as with any filter, the interpreter needs to determine whether such aggressive spectral balancing introduces ringing in the data. Such spectral balancing is amplitude friendly because a single time-varying wavelet is applied to the entire data volume. 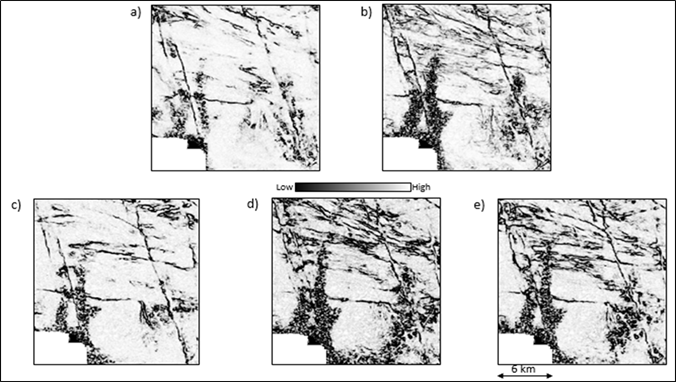 The figure below shows vertical slices through a seismic-amplitude volume before and after spectral balancing. The spectra were computed at intervals of 5 Hz ranging from 5 to 120 Hz. The balancing was computed using a value of ɛ = 0.04. The individual amplitude spectra before and after are shown as insets. Notice that after spectral balancing, the seismic section shows higher frequency content, and the amplitude spectrum is flattened. Coherence run on voice components at higher frequencies exhibits more detailed information. 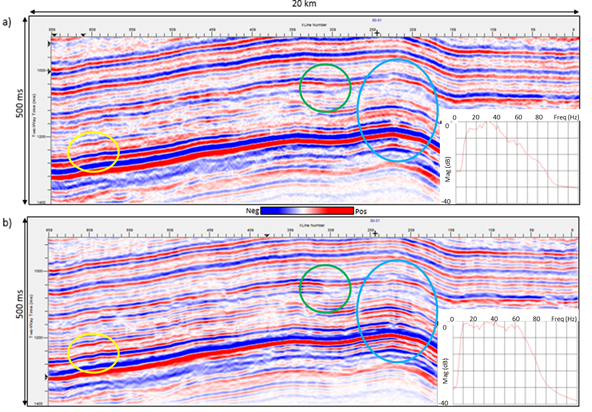 The results are shown in the figures below, where we notice better definition of the north-north-west–south-southeast faults as well as the faults/fractures in the east-west direction on the coherence run on the spectrally balanced version.